More Australians die in heatwaves than any other natural or climate related disasters. In Melbourne, cheap home retrofits can reduce the risk of severe health impacts in low income households. ​Hume Heatwave Help is a practical, grass roots response to improve the heat wave resilience of vulnerable residents. 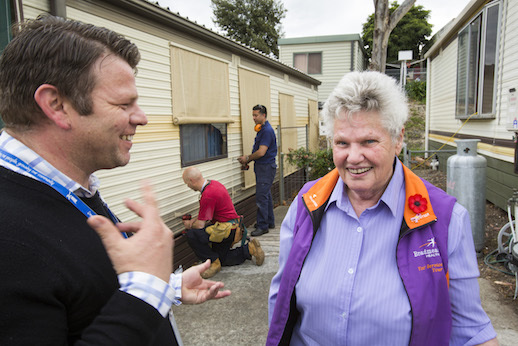 Just over 100 home retrofits have been completed for residents receiving Home Care services, with those identified as most vulnerable to heatwaves prioritised. An in-home assessment was conducted which included a heatwave survey and consent form, provision of a heatwave kit (information; thermometer; drink bottle and hand held fan) and an assessment of which retrofit products could be provided and installed. 102 retrofits have been completed including: installation of external Coolaroo blinds for east, north and west facing windows; provision of good quality desk and pedestal fans; under door and door frame draught sealing; compact fluorescent light globes where required and Draught Stoppas over kitchen and ceiling fans where safe to do so. The assessment and retrofit processes identified some clients who had no ceiling insulation whatsoever and these clients along with those with old, inadequate insulation (around 13 homes) are currently having insulation installed by a contractor. The project has also involved the development and delivery of home sustainability training for all of Hume’s Direct Care Workers by Kildonan Uniting Care. Direct Care Workers are in regular contact with Home Care Clients and are well placed to dispel myths and provide practical information about efficient ways to keep cool and safe in heat waves. A post-summer survey is being conducted to gather information about the effectiveness of the products and program. The project was made possible with funding from the Victorian Government. Following the funded program, Hume City Council is planning to continue to offer the service to at least 100 Home Care Clients a year on an ongoing basis. The project has been a successful partnership between Hume’s Aged Services and Public Health Department and Sustainable Environment Department. ​Download the case study here.